Powers/Abilities: A number of the Mourners possess certain mental or energy manipulative powers, However, these are only used as parts of the ceremony, and never in conflict against others. They have demonstrated the ability to rapidly travel to and from other dimensions. History: The origin of the Mourners is uncertain. They travel throughout the universe, performing services to commemorate the dead. The events that drove them to do so have not been revealed. (Quasar#26) - Quasar encountered the Mourners within the Eonverse as they were preparing to hold a ceremony for Eon, just after it had been slain during the struggle against Maelstrom. Wayopex questioned Quasar about the nature of Eon's death and requested permission to hold Eon's ceremony there. The Mourners held a memorial service for Eon, which was attended by a number of Cosmic entities, as well as Quasar. 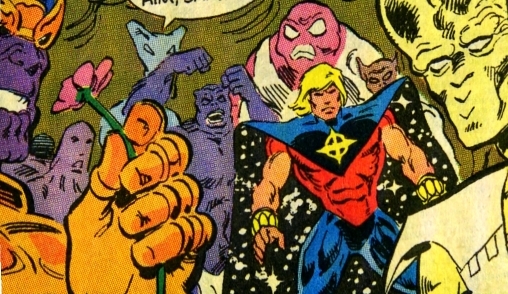 Thanos, an enemy of Eon, then possessing the Infinity Gauntlet, disrupted the ceremony. Quasar sent all present away while he attempted, futilely to deal with the virtually omnipotent Thanos. It is not certain if the ceremony was ever resumed. (Quasar#35) - Guided by Eon's daughter, Epoch, to the nearest lifeforms while investigating the Kree galaxy following the Nega-Bomb explosion, Quasar, Makkari, and Her arrived at and entered the Mourning Star. The Mourners were within the Kree Galaxy, preparing to mourn the billions of Kree killed at the climax of the Kree-Shiar war by the Nega-Bomb explosion on Hala. During the mourning ceremony, it was determined that the Kree had not passed on to the afterlife, and had instead been waylaid somehow. Upon investigating this, Quasar and his allies learned that the souls had been consumed by the Soul-Eater. Following that confrontation, Quasar left Her and Makkari behind on the Mourning Star, while he went to participate in the events of the Infinity War. (Quasar#39) - At Quasar's request, Makkari told Fath how Quasar had helped the dead Kree. Her then expressed a strong desire to leave and shared with Makkari, who was content to wait there until Quasar's return, and who was also curious to learn how the Mourners kept finding people to mourn. Meanwhile, Krugarr informed Fath that he had found the next mourning site, in the Advinter system in the Milky Way galaxy. After Fath introduced Krugarr, Makkari asked permission for Her and himself to stay with them for awhile, and Krugarr told them it would be an honor to have the companions of the Protectors of the Universe aboard their vessel. Her commented that she didn't see why, as anyone Quasar protected was one less person for them to mourn, but Fath told them they did not enjoy their task, but rather it was their solemn duty. Krugarr further explained how listeners like himself could hear the psychic screams of the dying, but when he answered Her's question that he could indeed hear such screams at the moment, Her was disgusted that they did nothing to help the dying and/or stop the killing. Fath tried to explain that they were not warriors or protectors, and that their purpose was to bring honor to those who had died; but Her flew off, telling them that they celebrated death and that honoring the dead was merely a guise. The Mourners starjumped the Mourning Star to the Advinter system and engaged their cloaking fields. One of the Mourners identified their target planet as being natively named Scadam, and a gold-skinned member identified the attackers as ravengers, plunderers, and pirates known as the Black Fleet; when he asked how long until their cruel work was finished, a pink-skinned, pointed-eared member responded that, according to a transmission she had intercepted, it would be within a rotation. Furious that they had the chance to save lives but rather seemed to want to maximize the loss of life for their mourning rituals, Her flew off and attacked the Black Fleet; as she departed, she told the Mourners of she died, she did not want them to mourn for her. (Quasar#40) - Watching from the cloaked safety of the Mourning Star, the golden-skinned member noted that is would seem Her sought to rout the invasion all by herself. Fath tried to explain to Makkari (who could not help in a space fight with no surface to run on), that the Mourners did not encourage or condone such widescale devastation, but rather they just accepted that no matter what anyone did, the universe was full of such death and destruction. He reiterated that it was their task to acknowedge and honor those who surrendered their lives to the universe's grand cycle of life and death. When asked if all the tragedy never bothered them, Fath admitted it affected them profoundly. Her was disgusted to learn that the Mourners do nothing to help the dying, and accused them of worshipping death. Her followed their direction to the planet Scadam, where she attempted in vain to stop the Black Fleet's attack. Eventually, she was forced to return to the Mourning Star or suffer permanent injury. It was only the power of the Starbrand, accessed subconsciously by Kayla Ballantine, that stopped the Mourning Star and all aboard from being destroyed by the Black Fleet. Her made an attempt to discover the source of that power, and was left behind by the Mourning Star. (Quasar#43 (fb) - BTS) - The Mourning Star barely made it into warp space to escape a shockwave unleashed by Kayla Ballantine's Starbrand power to destroy the Black Fleet. (Quasar#43 (fb) - BTS) - One of the Mourners (a being who Makkari was unsure if it was male or female) told Makkari of an alien race that moved at close to the speed of light at all time. The Mourner also told Kismet how to locate this race. (Quasar#43 - BTS) - The Mourning Star returned to Scadam's vicinit. Kismet (as Her now called herself) returned to the Mourning Star as it returned in hopes the Mourners could tell her who had driven away the Black Fleet she had fought, but she only enountered Makkkari. As Kismet wished to return to Scadam to investigate what had destroyed the Black Fleet, and Makkari wished only to investigate the super-speed race, the two parted both ways. (Quasar#45 - BTS) - The Mourning Star warped away from Scadam, unaware that Kismet was trying to come aboard to see if Makkari was still there. (Quasar#47 - BTS) - The Mourning Star dropped Makkari off on Grosgumbeek and departed for places unrevealed. COMMENTS: Created by Mark Gruenwald and Dave Hoover. The Mourners refer to the soul as the Zama, the afterlife as the Weavern, and Shulan represents some period of time, probably years or longer. In the crowd scene of the ceremony in #35, we can fairly clearly identify, an Elan (towards the top end of where you can recognize anything on the right), a Betan (front row, just to the left of Wayopex), a Kamado (to the left of the Betan), probably a Kodabak (possibly Sardan; a few people further over to the left), a Korbinite (to the left of the Kodabak), an Entemen (far left, front row), possibly a Kymellian (front row, around the corner from the Entemen, with his back mostly facing us), and maybe one of the Glx a couple rows back, behind the Kamado. He has not yet had his native race identified. He is the leader of the Mourners and officiates the Burial Ceremonies. He obviously has a big, brainy head and suction cups on his fingers. He looks to be about 8' (or possibly even 9') tall based on his size in comparison to Quasar. He is a Lem. He is a "Listener", who detects the deaths of significant beings and then guides the Mourners to the location of their deaths. He appears to be a Kodabak. He was outraged when Thanos disrupted the ceremony for Eon, but wisely restrained himself to avoid the wrath of Thanos. 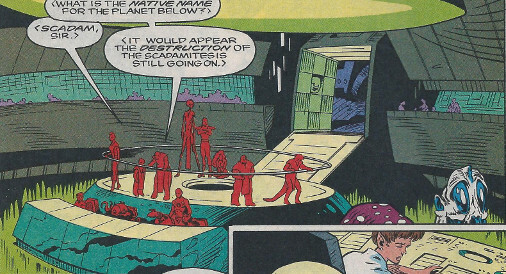 The Saran, or another Kodabak, also appears in #35, at the ceremony mourning the apparent deaths of the Kree caught in the Nega-Bomb explosion. He is an Interdite, and as such possesses certain empathic powers. He gathers information on the deceased, both to be used in the service, as well as being inscribed in a permanent record. It was Wayopex who identified that the Kree destroyed by the Nega-Bomb had not actually died. He is able to commune with the souls of the recently dead, and lets them know that they are being honored. 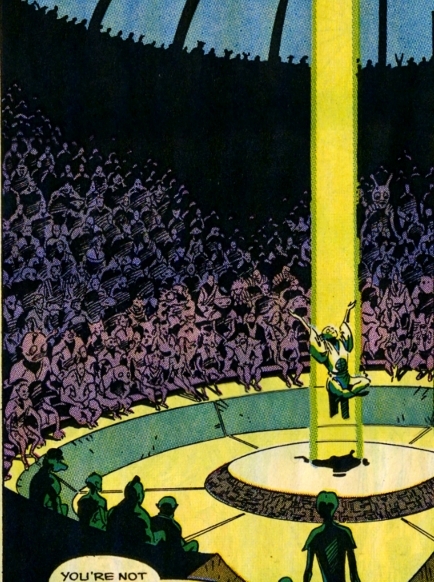 He is also pictured in the main profile, as the figure levitating in the middle of the ceremony mourning the apparent deaths of those Kree caught in the Nega-Bomb explosion. They were present at Eon's funeral as Thanos interrupted. The Betan is clearly seen under the flower Thanos is holding. Most characteristic is the sort of webbed neck, and his right wing poking out over his shoulder. 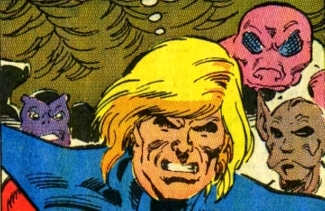 The Betan, or another Betan, also appears in #35, at the ceremony mourning the apparent deaths of the Kree caught in the Nega-Bomb explosion. The tall alien with triangular eyes with projections above it seems like it should be familiar...but I can't identify his/her race. The A-Chiltarian is the central one with his arms up in the air. You can see him a bit more clearly in the image below on the left, but those prominent forehead ridges, combined with the blue-ish apelike body and hair is pretty convincing. Over Quasar's left shoulder is an Alpha Centurian, as the panel to the left more clearly illustrates, and as Don Campbell pointed out. Thanks, Don! The Alpha Centurians OHotMU image doesn't show the crest on the head as clearly, but it is more clear in the profiles for Dynorr, and the sub-profile for the "old one." There's also a tiny image that shows his lower body, off to the right here. This group was present aboard the Mourning Star at the ceremony mourning the apparent deaths of the Kree caught in the Nega-Bomb explosion. The group pictured here was reacting to the empath Waypoex's sudden outburst that the Kree they were mourning were not actually dead. unidentified being with a pony tail and the "Members Only" type jacket looks really familiar...I'd have thought perhaps one of the Kree from Galen Kor's Lunatic Legion or possibly even one of the Brethren, but, in checking, the looks don't really match up at all. Any ideas? In the top right is a Guna...possibly the Guna from Eon's funeral (#26), but possibly another being altogether. Centrally and towards the top (just below and to the left of the Guna) is another female member of an unidentified being/race who is essentially human in appearance (my scan made her look more orange...she's really more Caucasian/"pink"-skinned in the comic). As far as possibilities for essentially human-like aliens, she could be native Arcturan, Axi-Tun, Clavian, Dakkamite, Galadorian, Hiber, pink Kree, Laxidazian (non-Deviant), Lumina, Myndai, Quist/Arcane, Sirian, Sirusite, Spartoi, Wilameanis, Zenn-Lavian, or a member of one of the countless others such races. The magenta (?--I'm pretty colorblind...some sort of red-purple shade) hair seems unique, and the earrings also seem familiar to me, but I can't place them. Below and to the right of the unidentified female is a Megan...possibly the Megan from Eon's funeral (#26), but possibly another being altogether. Below the Megan, at the bottom right is a Kamado...possibly the Kamado from Eon's funeral (#26), but possibly another being altogether. To the left and slightly above the Kamado is an Entemen...possibly the Entemen from Eon's funeral (#26), but possibly another being altogether. Above and to the right of the Entemen, central in the image, is a Courga. If this or another Courga was present at Eon's funeral, it was behind-the-scenes. They were present at Eon's funeral as Quasar sat down. The races are clearly recognized in the respective order above, to Quasar's left. 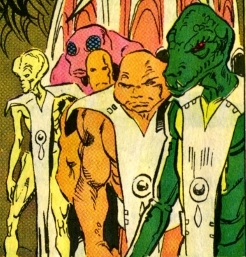 The Entemen, or another Entemen, also appears in #35, at the ceremony mourning the apparent deaths of the Kree caught in the Nega-Bomb explosion. The Glx, or another Glx, also appears in #35, at the ceremony mourning the apparent deaths of the Kree caught in the Nega-Bomb explosion. 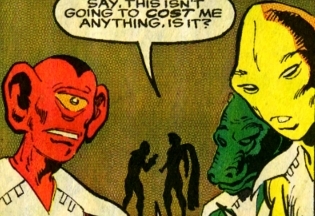 next is the apparent Guna; the Guna, or another Guna, also appears in #35, at the ceremony mourning the apparent deaths of the Kree caught in the Nega-Bomb explosion. 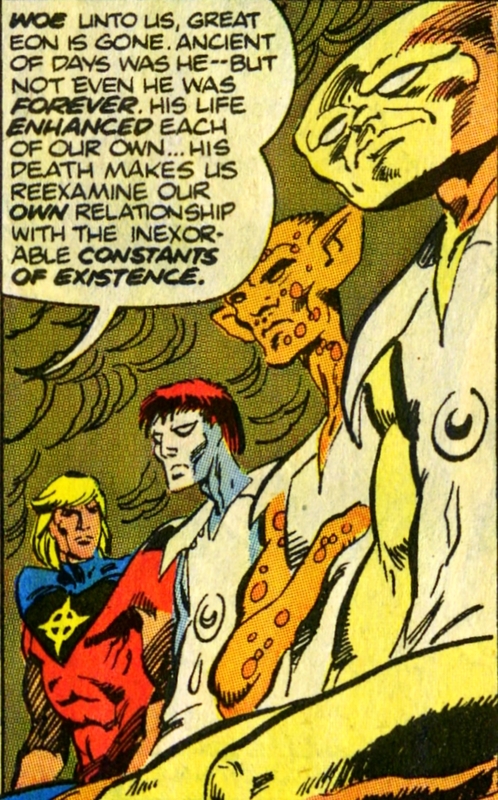 They were present when Quasar first encountered the Mourners within the Eonverse. They all presumably attended Eon's funeral. The Kawa is in the forefront on the far right. The Kamado is second from the front. 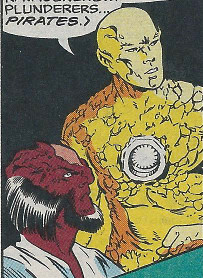 He, or another Kamado, also appears in #35, at the ceremony mourning the apparent deaths of the Kree caught in the Nega-Bomb explosion. The Korbinite is third, between the Kamado and Fath. He, or another Entemen, also appears in #35, at the ceremony mourning the apparent deaths of the Kree caught in the Nega-Bomb explosion. Skin color, prominent forehead, hairlessness, eye and mouth shape, and lack of nose all match the M'Ndavian form...just much less extreme than we typically see. The Megan also appears in #35, at the ceremony mourning the apparent deaths of the Kree caught in the Nega-Bomb explosion. This one was only seen on the periphery of an image where another Mourners were studying the situation in which the Black Fleet assaulted Scadam. It looks like we are seeing just the head and perhaps the shoulder, but we can't be sure. It's got white skin, large bluish eyes, and some sort of ridge on the foreheard. That's about all that can be said about this one. Both of these were part of the group studying the situation in which the Black Fleet assaulted Scadam. The golden/irregular skinned one identified the attackers as the Black Fleet and described their nature, after which he wounded how long it would be before the Black Fleet finished their cruel work. Presumably the same golden-skinned one was also seen in #40, noting how fiercely Her was fighing against the Black Fleet. He had some sort of implant or addition on his chest...reminds me of Iron Man's armor's uni-beam, or, moreso like the mini-arc reactor from the Iron Man movies. In the foreground on the image in the right, we can see Fath (our left) and Makkari (our right). I'm guessing that's what they were going for, rather than an existing alien race. She was part of the group studying the situation in which the Black Fleet assaulted Scadam. She intercepted a transmission that indicated that the Black Fleet would finish off the the Scadamites within a rotation. When the gold-skinned member asked how long until the Black Fleet's cruel work was finished, she shared the information from the transmission she had intercepted. She had pink skin and pointed ears (though was apparently otherwise humanoid from what we could see), and apparently was either very scantily clad or wore flesh-colored stretch-fabric. She could potentially be a non-Deviant Laxidazian, or perhaps a Thruvian? An immense intergalactic starship, designed along the lines of a gothic cathedral. Its halls are lined with shrines to extinct beings and races. It possesses advanced cloaking capabilities and can achieve warp speed.